Freeman's novel was clearly a labour of love. She was determined to research and investigate the mystery of her uncle's past, even though she never had the opportunity to meet him. This is an indepth telling of her father's and uncles' experiences throughout WWII, specifically around the events of Pearl Harbour and experiences POWs in the Philippines. Her writing drew me in and had me hanging on each page as I immersed myself in her family's history. 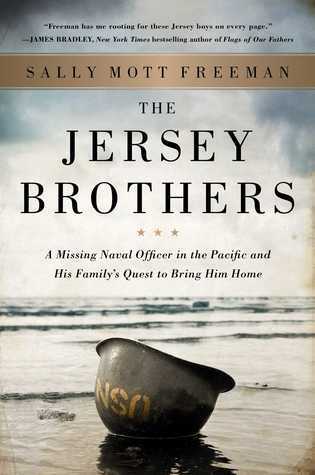 The Jersey Brothers is a memorable and gut wrenching story of one family's unwavering desire to save one of their own. Where do I even begin? I felt all kinds of connections to Sally Mott Freeman's telling of her family's past. The setting of where it took place and the situation I was in while reading it resulted in me finishing all 600+ pages of the book in just under 5 hours. First, the setting. Much of Barton's story takes place in various parts of the Philippines, the birth place of both my parents. I found myself jotting down all of the locations named as Barton was moved from one camp to another. After reading the book, I checked the locations on Google Maps and realized a couple of the prison camps are only a couple hours from where members of my family currently live. I also deeply connected to this book as I read it on a flight from LAX to KOA (Kona, Hawaii). Knowing that my travels later on that week would eventually take me to Pearl Harbor, it fueled my desire to learn more about Freeman's family. However, before even reaching Pearl Harbor, my interactions with our Air BnB host deepened the connection even further. On our third day, I had noticed a card on the fridge that had an image of a former Naval Officer. When I inquired about the man in the phone, our host went on to explain that the image was of her father, a Pearl Harbor survivor. Following this revelation, I told her about the book and the story of The Jersey Brothers and she was just as intrigued as I was. Readers who have an interest in WWII history may enjoy this novel. Based on where Freeman's family was stationed, readers are able to see the war from three very different perspectives: Bill (a White House advisor in charge of the first Map Room), Benny (an officer on the USS Enterprise) and Barton (a POW). The Jersey Brothers will be available on May 9. If you decide to give the book a chance, please stop by again to let me know your thoughts in the comments below. Disclaimer: I received an advanced copy of The Jersey Brothers by Sally Mott Freeman from Simon & Schuster for an honest review. All opinions are my own.